Anyone over 50 likely knows the feeling: You catch a glimpse of your reflection and realize the face and body you’ve always known has been replaced by a worn-out impostor. For best-selling author James Owen, that moment came on his 70th birthday, when he watched a video clip of himself giving a lecture. He was mortified to see how badly he had aged. Owen felt old, too. His back was in excruciating pain, and his rotator cuff was frozen stiff. He was clearly falling apart and shuddered to think what several more years of this downward slide might entail. He didn’t worry about how far or how long—he just knew he had to do something. He started off slow, just doing as much as he could handle. He immediately felt better, and his wife noticed how much better he looked. After 30 days, he wanted more. His workouts gradually became more intense, his health improved, and his self-confidence grew. 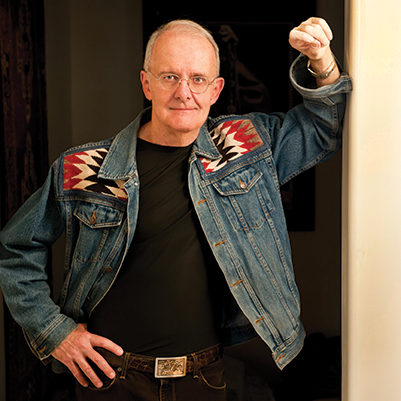 Owen turns 77 this month, but he’s in the best shape of his life: lean, strong, and pain-free. At a recent check-up, his doctor marveled at the dramatic turnaround in his health indicators. Owen credits his success to developing an exercise habit and is on a mission to inspire other elders to do the same. 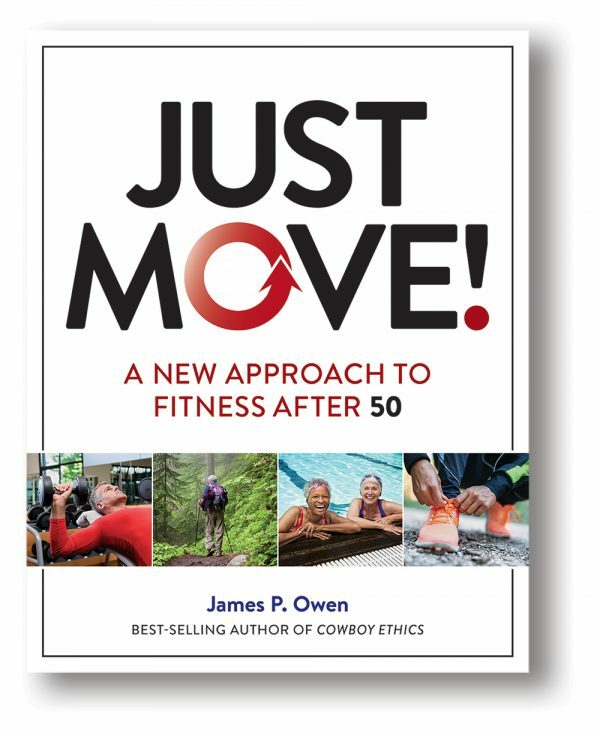 His new book, “Just Move: A New Approach to Fitness After 50,” is a call to action for older adults who are tired of watching their health deteriorate. “If you do this, your body will thank you,” Owen said. Although Owen loves to exercise now, he spent most of his life at odds with it. In high school, he aspired to be an athlete, but was slow and uncoordinated, usually ending up warming the bench. In his 40s, he jumped into an intense exercise routine, but soon quit because his knees and back hurt so bad. By his 50s and 60s, he had become a certified couch potato—too busy and tired to move any more than he had to. When Owen approached fitness this last time around, he began at a slower pace and with a different goal in mind than when he was younger. His inspiration wasn’t some fantasy number on the scale or six-pack abs, but something far nerdier: research. Although modern medicine has long promised that a new drug or procedure may soon reverse the effects of aging and illness, hard science shows that the real fountain of youth is found simply in eating well and moving more. A large body of research over the past 30 years reveals that regular exercise protects against chronic disease far better than any pill or treatment available. This idea isn’t new. The earliest texts of traditional Chinese medicine, for example, point to a time when elders were able to preserve their health far into old age. One of the top tips from these ancient books is to get regular exercise to keep the body feeling youthful. Most modern exercise science is focused on the benefits of cardio. That’s why health experts feel so comfortable recommending it. Emerging studies point to unique benefits associated with other forms of exercise such as strength training and yoga. Exercise not only helps with physical health, but mental health, too. A recent study finds that those who exercise just one hour per week can significantly decrease their risk of depression. Unfortunately, we’re moving less than ever. The average adult sits an average of 10 to 13 hours per day. Inactivity is the fourth-leading risk factor for global mortality, and is directly responsible for 3.2 million deaths per year. It’s not unusual for people to slow down as they age, but it seems many of us barely budge from our seats anymore. According to certified yoga and qigong instructor Cynthia Singleton, a big reason why older adults are resistant to exercise is that it conflicts with the stereotype of what old age should look like. “We’ve all heard the [complaints about aging] from older relatives. … We often buy into their experiences of aging, not realizing that ours can be completely different,” she said in an email. There are many elderly individuals who defy the stereotype, like the 99-year-old man Singleton recently danced with at a family gathering. He still goes out every day to check on the cattle at his small ranch. Singleton contends that what keeps people feeling vital in their old age is moving their body on a regular basis. “Movement is life, and our bodies were built to move,” she said. A sedentary lifestyle takes a toll even earlier than you might imagine. Not only do we start gaining weight at a younger age, our body functions also deteriorate faster. In our 20s, we begin to lose our sense of balance. In our 30s, our oxygen consumption and bone density begins to decline. In our 40s, memory starts to fade, and by our 50s our loss of muscle mass accelerates to about 15 percent per decade. Fat accumulation speeds up too. By the time one hits the elder years, a lifetime of sedentary habits contributes significantly to a variety of chronic illnesses. At this point, exercise no longer seems like an option because even minor movement can be extremely painful. But there still may be time to turn things around. “It’s harder when you’re 70 than when you’re 40 or 50, that’s for sure. But I’m living proof that it’s never too late,” Owen said. You might imagine exercise to be more of a young person’s game. But when it comes to developing an exercise habit, being older may actually give us a leg up. Young people tend to approach fitness with short-term goals such as looking better in a bathing suit or losing 20 pounds for a wedding. When Owen found his inner athlete in his 70s, he began with a different set of priorities. Instead of image, Owen’s goal is to condition his body so that it can better meet the demands of daily life. 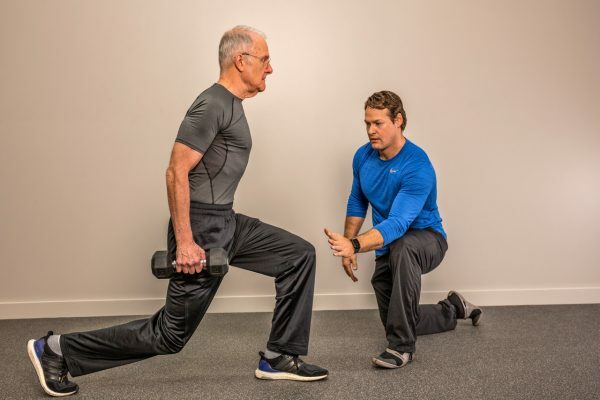 His book features a program he developed with health experts to hit what he calls the “five dimensions of functional fitness”: strength, flexibility, core stability, balance, and cardiovascular endurance. You can find moves that are both fun and challenging at any stage of fitness ability. But avoid taking on too much too soon, as it increases your risk of injury. Exercise can be a little uncomfortable, but the magic is in subjecting your body to small challenges every day, which pushes it to work better. Once you feel your functionality improve, the progress becomes empowering.